“I grew up around a lot of people – friends, family – who were meditating. Meditation is an incredible way of centering myself, of calming myself, and really getting perspective on where I am. 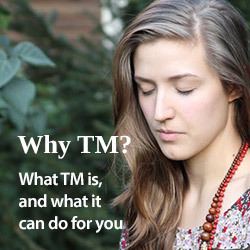 The best thing about Transcendental Meditation is that it’s such a personal thing. (…) I felt like reaching out and searching for ways to soothe myself and to help myself.